The font-size property can be set for any HTML tag (even if it would not normally contain textual content like br). It can be assigned a variety of absolute, relative, or length size parameters. An element will inherit the font-size of its parent unless you override it. This is especially important when you specify relative sizes. Several absolute font-sizing keywords are available. The font size is determined from a browser preset and the element will not inherit its parent’s size. Although most browsers support these keywords, the exact sizes will differ. They are a fairly crude method of font sizing and are generally avoided by most developers. For example, if the parent has a font size of ‘medium’, a value of ‘larger’ will set the element to ‘large’. Other font units are normally altered by a factor of around 1.2 but, again, there is no standard and browser results will differ. cm: centimeters, e.g. 1cm ( = 10mm). in: inches, e.g. 0.39in ( ~= 10mm). pt: point, where 1pt is generally assumed to be 1/72 inch e.g. 12pt. In general, there are issues with all these measurement units. Millimeters, centimeters and inches are inaccurate for a screen-based medium. Points and picas are unreliable since systems can use different dpi settings. Pixel appears to be the most suitable, but it can lead to accessibility issues because the text cannot be resized in IE. em: 1em is equivalent to the current font size, so 2em is twice as large. %: 100% is equivalent to the current font size, so 200% is twice as large. ex: 1ex is equivalent to the height of the letter ‘x’ in the current font. Few developers use ‘ex’, but it can be useful in some situations where you need fine-grained font sizes, e.g. 1ex rather than 0.525em. Percentage and ’em’ sizes are equivalent, e.g. 50% = 0.5em, 100% = 1em, 120% = 1.2em, etc. Some browsers exhibit subtle differences but it’s rarely a major problem. If you want to save every byte, you could choose the shortest definition, i.e. 50% is shorter than 0.5em and 1em is shorter than 100%. allow both text sizing and page zooming. Just to complicate matters further, Internet Explorer does not allow text resizing on elements which have a font size defined in pixels (px). If you’re a designer moving to the web from a print background, it’s disconcerting to give the user that much power. Your design could be ruined by a user zooming in 200% but reducing the text size to 50%. And — no — there is nothing you can do to prevent it. Nor should you. The general consensus is that ’em’ or ‘%’ is the best solution in most situations. 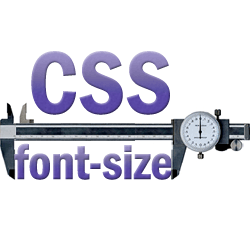 Fonts can be finely scaled relative to each other and browser text sizing is supported. I would also recommend using a percentage font-size on the body tag; it results in better text-sizing in some older browsers. try reasonable combinations of text sizing and page zooming in a variety of browsers to ensure the text remains readable. Has font sizing ever caused you problems? Do you have any other tips?